Review: "Stolen Babies: There Be Squabbles Ahead" - Sea of Tranquility - The Web Destination for Progressive Music! Leave it to The End Records to once again find another cutting edge band that combines a myriad of styles, in this case avant-garde, metal, horror-punk, goth, industrial, and prog, into one bizarre yet interesting melting pot. 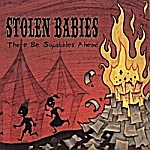 Stolen Babies, an eclectic four piece, who also boasts some guest appearances here on There Be Squabbles Ahead from Sleepytime Gorilla Museum, sound like a wacked out hybrid of cabaret music, Mr. Bungle, Cradle of Filth, and label mates SGM and unexpecT. Sound a little off the wall? Well, it certainly is, and at first not an easy listen, but it's one of those albums that really grows on you after a while. Lead singer Dominique Lenore Persi, who also plays accordion, glockenspiel, and jaw harp, delivers a variety of vocal styles, from sweet pop, to engaging Broadway styled theatrics, to blistering black metal styled screams. She adds the class and sophistication when needed, but can also pummel the listener with plenty of angst and metal aggression, giving the album an overall nice tapesty of flavors. Rani Sharone handles all the guitar and bass parts here on the album, and does a fine job bashing out plenty of thrashy crunch as well as melodic bass grooves. The other two members of the band are Ben Rico on keyboards, and Gil Sharone on drums, who contribute mightily to the overall richness of the band's sound. If you get a chance to venture onto the Stolen Babies website, you will see that the band dresses up in wild costumes that are a cross between circus/carnival attire with black metal garb (think Sleepytime Gorilla Museum meets Cradle of Filth), so their stage show takes the avant-garde nature of their music one step further. Produced by Dan Rathblun of SGM, who contributes some tuba and vocals here, along with fellow SGM member Carla Kihlstedt on violin, this is a great sounding record that has so much going on that it will have your head spinning for the first few spins before it all begins to make sense to you. Once you cross that plateau, you will find an outrageous collection of songs that are hard to classify, but extremely enjoyable. "Push Button", a song chosen as the first video, is a perfect example of the abundance of styles going on with Stolen Babies, as it has plenty of catchy pop melodies to go along with serious prog-metal heaviness, and a gothic touch. It's a wild ride from start to finish. There Be Squabbles Ahead is still mystifying me, yet exciting me at the same time. Just when you thought you have heard it all here in this great year for metal and progressive music, out comes something to throw you for a complete loop and keep you guessing spin after spin after spin. The End Records is quietly becoming one of the best labels for avant-garde metal releases, and Stolen Babies is another in a fine string of CD's to come out from them this year. Come with me dear readers on a journey deep inside the depths of the beer halls where the insane come to mingle. For the price of entry and a two-drink minimum, I ask that you join me at a table off to the side of the stage where tonight's performers are the Stolen Babies. TSB is an Avant-Garde/Gothic/Metal Cabaret group that is led by Dominique Lenore Persi who is the bands singer/screamer and accordion player. Ms. Persi has a voice that is beautiful and melodic in one second and then the raving screams of a lunatic at the others. She is quite the dynamic performer and the rest of her group is no different. They are indeed a fascinating, interesting and very mystifying unit and their debut release on The End Records will leave you scratching your head even after several listens. It is really one of the most eclectic and curious groups that I ever had the pleasure of listening to. The four-piece ensemble has a very strong visual presence but sadly you lose this on an audio CD � the photos on their website and by the included video for "Push Button" prove that they are a "must see" type of band and come off like a cross between the weird kids in the school band mixed with Alice Cooper ala Torch Singer with a dab of Metal. Confused? Good, because I have listened to it four times and I am still like "hmmmm". The winning tracks like "Push Button" and "Lifeless" show the levels of diversity that is possessed by the group while the opening track "Spill" is simply a throttling Metal number. The groups association with the members of Sleepytime Gorilla Museum leads to appearances of that band on the recording and it helps add a little more to the overall strangeness of the piece. We have Dan Rathburn from SGM doing tuba and vocals while Carla Kihlstedt adds violin. Rounding out the lineup of The Stolen Babies are Rani Sharone (guitars), Ben Rico (keyboards) and Gil Sharone (drums). It's really a fun album for as each track progressed you are left wondering how they came up with it and what could possibly be next. I have to hand it to The End Records, because based on TSB, The Unexpect and Lordi they are showing that there are no rules to follow when it comes to Metal, Rock, and all that lies between the two peaks. There are progressive things here, melodic and metal things, harmony and disharmony and when it is finished I dare you to not give it one more spin, confident in your ability to "get it" the next time around. The Gothic Cabaret aspect of the band might appeal to those who enjoy Dresden Dolls, but TSB are fare heavier than that pair which left me saying if you are a fan of Mr. Bungle, Oingo Boingo, Cradle Of Filth and the like then this is definitely for you. The band includes lyrics to all these rantings for your better understanding and all the original artwork in there is done by Crab Scrambly (noted indie comic artist). "There Be Squabbles Ahead" makes very clear the bands ability to stand defiant against convention and leave you thinking/confused when it has all passed you by. MIO stands for Metal In Opposition. It is an avant garde form of metal-oriented music that stands in clear opposition to the classic metal we grew up with. It is progressive in every possible sense of the word, it is push-the-envelope original, it bows to no convention, and it's damn cool! And yes, it might be a bit challenging for some. Like so many of The End Records's better MIO acts, Stolen Babies is an unconventional blend of hard rock, death metal, folk, and a handful of other genres that probably don't have a name. Throw in a charismatic female vocalist, a band leader who also has a background in film scores and special effects, a stage show to rival that of label-mates Sleepytime Golilla Museum, and a dose of circus / carnival pomp - complete with occasional oom-pah-pah beats - and you're beginning to get the idea. There Be Squabbles Ahead is theatrical, it's quirky, it's pompous, and the band leader's love of cartoon music plays through clearly - often expressed in the eclectic selection of instruments - including jews harp, mandolin, baby sitar, toy piano, marimba, tuba, trumpet, euphonium ... alongside the relatively normal ensemble of guitar/bass/drums, piano, violin, cello, clarinet, saxophone, and glockenspiel. Singer Dominique Lenore Persi dominates the songs with an odd mix of guttural not-quite-death-styled growls, then she'll switch to a clean but hard low-range, dark voice, and she gets quite angelic in places. Another dominant sound in many tracks is the bass - a clean, very fat sound that defines a lot of the music. Listen to "Awful Fall" and particularly "Tablescrap". Persi's occasional French cafe accordion adds interesting textures to arrangements that are already deeply layered, with interesting structures and well performed. The band members of Stolen Babies have played together since they were in high school. There was a band called Fratellis - a multi-artist stage-oriented act, and "Stolen Babies" was the name of one of their songs. So when they decided to downscale and take on a more professional hue, they took the name from that song's title, and There Be Squabbles Ahead is their debut full-length album. By all accounts, Stolen Babies does an excellent stage show, with a very visual aspect - including costumes, makeup, and props hand-made by band-leader Rani - the ex-special effects guy. Cover artist Crab Scrambly (yup - that's a name) provides the cover art, video, T-shirts, the very imaginative web site, and helps with the props - and is considered to be a 'silent member of the band'. Add all this artwork to the rich, powerful music and the other-worldly stage show, and Stolen Babies provides more than just a bunch of songs - this is a whole experience in the arts.